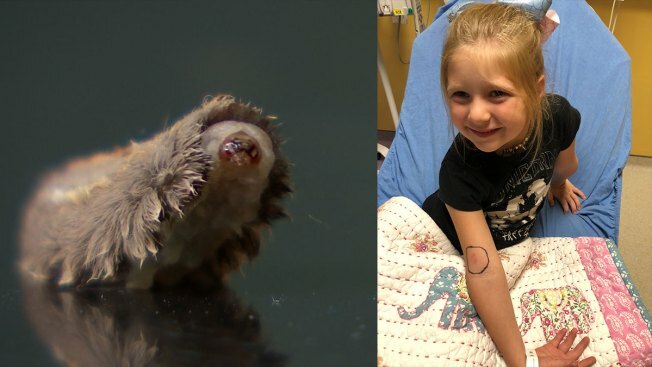 Lauren Chambers didn’t know what to think when she received a call from her daughters’ daycare that 5-year-old Adrie couldn’t move her arm after getting stung by a caterpillar. “They said that she had been stung by the most poisonous caterpillar in the United States,” said Chambers. Daycare workers believe the woolly looking caterpillar fell from a tree above Adrie as she was playing outside. “It was burning,” said Adrie. After she told them it felt like it was stuck in her arm, they did a quick search to learn it was a Southern Flannel Moth Caterpillar or an asp with venomous spines buried beneath its hair. “How does that happen? We have those here in Texas? I mean I never even heard of those before yesterday,” said Chambers. Michael Merchant, an entomologist with Texas A&M University says they’ve received more calls about the bugs this year though they don’t know why. “They’re common on a lot of trees and plants we have in North Texas… on oaks, yaupons, even rose bushes,” said Michael Merchant. He said it’s a series of spines hidden below the caterpillar’s distinctive hair that are filled with venom and responsible for the painful sting that can last up to 12 hours. “Different people react in different ways, feeling pain in different parts of the body. I had one friend who actually felt like he was having some heart trouble or something after he got stung. So it’s not a pleasant experience,” said Merchant. Adrie’s bite led to pain, swelling and an upset stomach. But had her teachers not thought to quickly remove the spines from her arm with tape, doctors tell Chambers it could’ve been much worse. “They said if that had not happened it could actually cause her whole body to go numb and start shutting down,” said Chambers. According to Merchant, the caterpillars should start to disappear in the next couple of weeks as they prepare their cocoons for winter. Once they hatch as moths in the spring, he says they’re no longer have their harmful spines.